More than just a cup of coffee, leave it to master barista Angelo Abordo to create an inspired cup of latte that's a feast for the eyes. A multi-awarded master barista, Angelo Abordo creates his masterpieces daily at The Coffee Shop of Hotel Celeste. Leave it to Angelo, or Gelo, to create something special for a unique coffee experience at Hotel Celeste. The culinary force behind the Lombardi's Authentic Italian chain, Chef Davide Lombardi brings traditional Italian cuisine to Hotel Celeste. Lucia Ristorante at Hotel Celeste features classic Italian dishes from antipasti to mains, pasta and pizza to desserts, from Chef Davide Lombardi's family recipes. How does one top an awesome lechon degustacion experience, with lechon stuffed with Sisig, or with garlic, herbs and potatoes, or with truffle rice? Leave it to Pepita's Kitchen to come up with another epic version with even more surprising lechon creations. Here's yet another round with Pepita's Kitchen's Lechon Degustacion (check out my epic experience with Pepita's Kitchen for the first time here at http://dude4food.blogspot.com/2012/12/an-awesome-lechon-degustacion-at.html), a version 2.0 for the ultimate lechon degustacion experience. Mad for Garlic, an original when it comes to Italian-themed garlic-infused dishes, introduces nine new cocktails ranging from tropical fruit blends to creamy concoctions, each unique and different. Cocktail classics with cool twists, and surprising, even quirky new blends that can only come from Mad for Garlic. More than the mathematical constant, Pi now means a great breakfast. From the man behind Pino Resto Bar and its vegetarian counterpart, Pipino, Chef Ed Bugia introduces another equation that includes all your favorite breakfast classics, including pies, and more at Pi Breakfast and Pies. Situated right beside Pino Resto Bar and Pipino along Malingap Street in Teachers Village, Pie Breakfast and Pies is the only all-day breakfast joint in the area. Converted from a former laundry shop, the space now serves some of the freshest bread and classic breakfast dishes in Teachers Village. And there's nothing better than the aroma of freshly baked bread that surrounds you when you enter Pi Breakfast and Pies. Racks strikes gold with the newest addition to its signature line of ribs, the new Carolina Gold Pork Rib with a distinct and flavorful Carolina Gold sauce. Known for its flame grilled, fall-of-the-bone ribs, Racks remains the undisputed name for authentic and classic ribs. And the Carolina Gold Pork Ribs is definitely one more reason to visit Racks. Drawing inspiration from the regional Carolina style barbecue, the new Carolina Gold Pork Ribs from Racks uses a traditional "Carolina Gold" sauce, a blend of vinegar, brown sugar, spices and mustard for that unique gold color and flavor. Carolina style barbecue is predominantly pork, often with a vinegar based glaze. Racks' newest dish captures the rich Southern Carolina style of barbecue with its Carolina Gold sauce that works really well with pork. A good cup of coffee paired with dessert, now that's a coffee break. And at Fika Cafe, you get all that. And more. Sometimes all you need is a good coffee break. Named after the Swedish word for "coffee break," Fika Cafe offers premium coffee blends and an extensive selection of desserts for that perfect coffee break. Located at the Capitol Greenstreet Mall, you also get an awesome view of the golf course. Coffee, dessert and a view...just can't get better than that. Not many bars have great food to go with their cocktails. And rarer still to find a bar with great food and cocktails, and two cool bars in one venue. Now you can have a great dinner, a few cocktails, and go to another bar for more cocktails without even leaving the place. Now how cool is that? Since it first opened three years ago, Dillingers 1903 Steak and Brew has redefined the bar and pub slash bistro scene with great cocktails and great food. More than the usual pub grub, the new menu at Dillingers includes a wide selection of dishes and flavors, comfort food and international classics, elevating bar chow to a whole new level. Named after the notorious Depression-era gangster, the interiors of Dillingers exude an old world yet casual vibe with the use of dark wood and colors, just the place for a few drinks. And yes, even dinner. 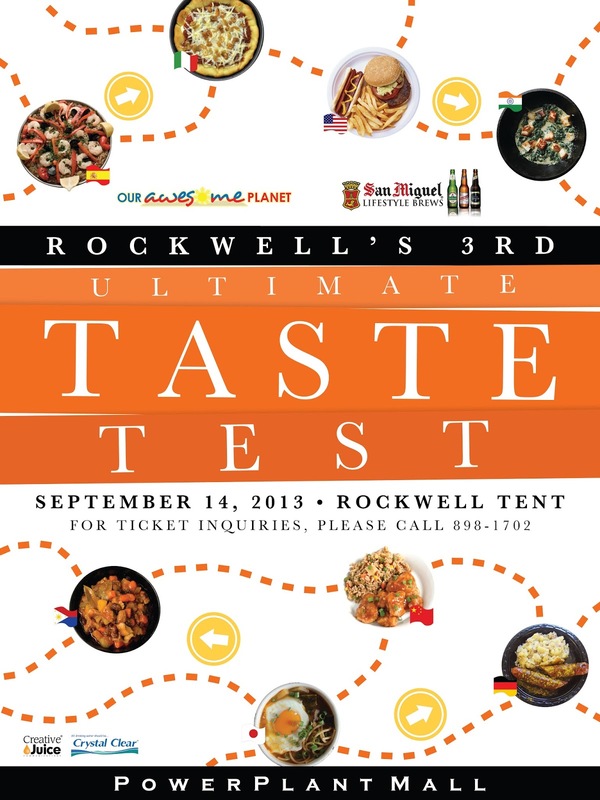 This year's edition of Rockwell's Ultimate Taste Test features over fifty food booths, from shawarma to lechon, chocolates to cakes and desserts and everything in between. Here's my Top 12 Must Try List...why twelve? Why not. 1. The Plaza Premium Baked Ham's Hamwich and Hampanada. Can't go wrong with ham. 2. Schmidt's Gourmet Hotdogs, who doesn't love hotdogs? 4. Diplahan Lechon, this one blew me away, check out my previous post on Diplahan Lechon here at http://dude4food.blogspot.com/2013/07/diplahan-lechon-best-of-mindanao-lechon.html. 5. Flavor Avenue's Bagnet Paella. It's got bagnet, what's not to like? 7. Bad Decisions Premium Premium Burgers and Drinks Joint, when it's bad, it's got to be good. 10. Bronuts...this got me curious. 11. Shmallows Marshmallow Spread...sounds like a great idea. 12. Everything with Soya's Chilled Soya Pudding, something healthy to balance things out during the eatfest. But there are more stalls to check out, over fifty, so this should be a great way to spend a weekend. Got your tickets? Better hurry, and see you this Saturday! Want to see more? Check out my post on Rockwell's 3rd Ultimate Taste Test here at http://dude4food.blogspot.com/2013/10/quick-bites-sights-and-flavors-at.html. For ticket inquiries and reservations, call 898-1702. Dude for Food is now on Facebook, check out the FB Page for regular updates on good eats and cool events. Better yet, click "Like" and enjoy the ride...just look for the FB "Like" widget on the right sidebar. Chilli & Ink: Ready For Some Serious Heat? Sure, you've tried some real spicy wings, but are you ready for some serious heat? Established in late 2012 by a group of friends sharing the same interests including mixed martial arts, spicy food and tattoos, Chilli & Ink is a unique dining and tattoo shop located in the emerging food district of Teachers' Village in Quezon City. Spicy chicken wings and tats, all in one place. Just can't get any better than that. High above the city overlooking the Capitol Hills golf course is Capitol Greenstreet Mall, the former clubhouse and now home to one of the iconic names in Filipino cuisine. Since it first opened way back in 1991, Dencio's Bar & Grill has been known for its near legendary version of Sisig served on a sizzling plate, a familiar dish best paired with an ice cold beer. Years later, Dencio's very own sisig remains undisputed, still the best sisig in the metro. Dencio's offers al fresco dining for the best views, as well as an enclosed dining area with floor to ceiling glass windows so you don't miss out on the view. And I'm told that in the evening, the views can become pretty awesome, with the city lights and stars combining for a spectacular show. A final lunch in the City of Blooms, with a Kadayawan inspired lunch buffet at The Marco Polo's Cafe Marco. A fitting end to an amazing four days at The Marco Polo, capping a memorable trip to Davao. The special lunch buffet theme culminates the annual Kadayawan festival at The Marco Polo, highlighting local and regional dishes as well as international favorites. And the buffet spread at Cafe Marco, whichis already impressive, goes a notch higher with the special Kadayawan inspired spread featuring lechon, a slow roasted whole pig, and an extensive selection of local and international cuisine. Home-style cooking and one of Davao's best kept secrets, Lachi's is a favorite among Davao locals for classic and comforting Filipino dishes. Located in a primarily residential area, which seems appropriate with Lachi's style of home cooking, Lachi's elevates the simple flavors of home cooked meals a notch higher with its made from scratch dishes. Named after the family's matriarch, Lachi's is also known for its desserts, reason enough for locals to patiently line up at Lachi's for a table. Michael Aviles, who runs Lachi's along with brother Melvin, manages the family-run establishment. Unlike many restaurants, Lachi's is closed on Sundays and on most holidays so the staff can be with their families. This alone makes Lachi's different. And special. Local flavors, the region's very best, all in one place. I had a rare chance of sampling Davao's best in one amazing afternoon, and delicious things are definitely happening in the City of Blooms. Long known for its bountiful local fruits and rich marine resources with its iconic durian and fresh tuna, there's a new breed of food entrepreneurs who are about to change Davao's culinary landscape. These are interesting times, and for Davao, tastier times too. Here's another reason to drop by IHOP for breakfast. Or Dinner. IHOP's new Griddle Melt Sandwiches, hand crafted and made to order sandwiches using artisan sourdough bread with a choice of three fluffy omelets. And the new sandwiches are also a great value too, with a full sandwich available at P 385 and a half serving for just P 325. "Continuing our commitment to bring our guests the best comfort food that IHOP - or anyone - has to offer, these Griddle Melts are a treat that they can enjoy any time of day," said Archie Rodriguez, President and CEO for Global Restaurant Concepts, IHOP's exclusive franchisee in the region and the company that introduced the brand to the Philippines. "While other restaurants may serve you sandwiches that are pre-made in advance, every single Griddle Melt is made to order. Bursting with flavor and made with the finest ingredients, the Griddle Melts, like all our classic IHOP offerings, will definitely put a smile on your face." Fresh off the gridde and straight to your plate, with the crisp outer layer of the sourdough contrasting with its soft and almost creamy center, providing the perfect base for IHOP's cheese omelets. Real Singaporean flavors and probably the best Crispy Cereal Prawns in the metro...now you don't need to travel far for authentic Singaporean dishes. You can find it all at Boon Tong Kee. Boon Tong Key's story begins way back in 1979, starting as a small chicken rice stall in Singapore's Chinatown. Inspired by the stall's success, owner Thian Boon Hua then opened his first full service restaurant at Balestier Road in 1983. Since then, Boon Tong Kee has expanded to seven branches in Singapore, with a growing presence in Thailand and Indonesia. And Boon Tong Kee's Singaporean flavors have now reached Manila.